I was following this recipe for Chinese Stir-Fired Steak with Peppers. I think I messed it up by cooking this for too long. The meat (I used lamb's meat) turned out very hard, like rubber. I suspect this was because I cooked it for too long. Can someone confirm this? I will be much obliged. Yup, cooking most meat too long is a bad thing. Cooking lamb too long like that will result in rubber. Its also possible that you accidentally cut with the grain instead of against it - which would result in a very chewy, rubber like texture. You end up with long proteins that are harder to chew. When you cut across the grain, its a bunch of very short proteins. I like to add some extra comments to this post and also may give some criticism of the recipe. As @rfusca said, cooking too long is a bad thing, which is true in some way. However, I think it's too broad to conclude cooking too long is the ultimate reason. There are parts of beef that they get tender as you cooking longer such as beef brisket. Without going into too much science, the general rule of cooking is that meat get hard as it loses its moisture and arguably its fat. The art of Chinese cooking is to try keeping the moisture in the meat and the cornflour in the recipe was to seal moisture in the meat. Cut across the grain, don't cut along it. I am not sure if I am using the correct terminology, but you will see the very long beef grain (texture) when you look at the beef surface. To explain it a bit more clear, I have drawn up a image to explain what I mean. (A) The diagram (A) shows how you should slice / cut beef if you have a chunk of beef like skirt or round steak. You should cut through the grain. (B) Typically the steak buy are not like what I drew in diagram (A) as butchers usually cut through beef texture to make pieces of steak. 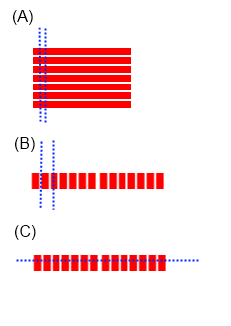 If you slice your beef like diagram (B), then you will end up with beef slices with very long grain (texture). Longer the grain (texture) is, the chewer you will find as it's harder for us to tear apart the long texture. As @rfusca said, "When you cut across the grain, its a bunch of very short proteins." (C) To resolve the issue in diagram (B), you can slice beef on the bigger side which you will cut through the texture. 2.Choice of beef - there is no doubt sirloin steak is premium steak and it's perfect for western cooking. However, I believe it's too lean for stir-fried, although I have used sirloin using the diagram (C) method which also worked fine. I would suggest to try using different steaks such as round steak, skirt steak or rib eye. Rib eye is actually pretty ideal and the fat content will help cook and it will come out very tender, but it's probably too pricey. Skirt and Round steaks are cheaper and they are always the forgotten choices. I found skirt and round steaks tend to have more moisture inside the meat and they will turn out quite well. In fact, they are quite close to what Chinese would use in stir-fired. i. Slice the steak into (1cm in the recipe is too thick) 0.3 or 0.5 cm thick slices across the grain. The thinner the beef, the easier you can control your cooking. ii. Don't whisk with your ingredients. Put them in following the order below. Add soy sauce, sugar, ginger & maybe 20ml of (water or rice wine). Please note that the amount of water depends on your beef and how you mix it. When you put in soy sauce and sugar, you should stir it through the beef and you will notice the sauce will get absorbed by the beef. If you notice all the sauce get absorbed straight away, it will be good idea to get some extra water but don't over do it!! Don't end up with too much liquid in your beef marinade. You want to see all your sauce get absorbed and should take out any excessive liquid. Once you have a good mixture of beef marinade, you then add in the corn flour. You want the cornflour to coat the beef very nicely. (This is what was missing in the original recipe) Put about 1.5 table spoons vegetable oil and stir the oil through the beef. The oil will help to seal the moisture in the meats. Then you follow the original recipe to cook your beef 1/3 a time for 2-3 mins depending on how thin your beef is. Please don't cook over 3 mins. Once you set aside your beef, then don't follow your recipe to put your beef in the wok again with peppers. Cook your peppers and onions. ONLY put your beef in when the peppers and onions are cooked, then put your beef in to toss it up with peppers and onions for 30 seconds. iii. You should now have a very nice beef stir fried. Not the answer you're looking for? Browse other questions tagged meat cooking-time lamb or ask your own question. Help roaster oven quit in the night! How to rescue 'dry' carnitas?